Okay, we're coming down to the wire. We can argue over the polls all we want, tomorrow we'll see the results of the only one that matters. What would you do if you went to vote and they wouldn't let you? What if you got something in the mail telling you where to vote, and you went there, and it was the wrong place? Or the wrong day? I'm afraid most of us would just shrug and go home, maybe complain to somebody, there's probably a toll-free number somewhere where they'll take your comments and get back with you sometime. I know some people are predicting there may be violence tomorrow, but I don't think most people will care enough to take any action if their voting rights are taken away from them. Maybe in a few months the ACLU can file a lawsuit or something, after it doesn't matter any more. Twalk amongst yahselves. This is your last chance before election day. Tomorrow you'll put your money where your mouth is, and by the next morning we'll know what direction this country is going to take. Your subjective photojournalism is, actually, quite repulsive. If such pictures of Obama exist, I don't want to see them. The source of your story, MSNBC, is so partisan that they are regularly ridiculed by liberal bastion, SNL. Keith Olbermann's over-the-top bias was lampooned in a skit on SNL Saturday night. Both he and Chris Matthews have been banned from election night coverage because of viewer complaints about their lack of journalistic professionalism. Hillary Clinton had complained that Obama had used some of the tactics alleged here in the primaries. oh yeah. it's all the MEDIA's fault. "Conventional wisdom picks Obama. Nostradamus, four and a half centuries ago, picked John McCain," said Dr. Hubert Evans, professor of Renaissance Studies at Yale University and author of the best-selling Nostradamus: Prophesize This! "Quatrain 78, Century X in particular seems to indicate that Obama had better not be measuring the White House windows for curtains quite yet, at least by my interpretation," said Dr. Evans. Bedecked in finery and the pelt of a wolf." And the Great Bear responds in kind, and, well, The End." I remember the dirty tricks Steele and Ehrlich pulled in PG the day of the election. I still want to know why they hired homeless guys from Philly- were they too stupid to know we have homeless guys living in Baltimore and Silver Spring and Langley Park? While I am a poll worker and not a poll watcher- I am prepared. We have information prepared by legal counsel in the State of Virginia. Why is it that the republicans are always trying to make minorities look stupid just because they look different? It is quite pathetic. It is shameful and just right up AnonBigot´s alley. why don't you follow your leader? I will drink a toast tomorrow night to Barack Obama, our new President(I'm not sure what but in honor of this very special occasion, it will be alcohol). I have supported Barack Obama since he started running for president and will celebrate the positive change he will bring to our country and to the world. I hope wherever you are when the results are announced, you will join me in celebrating his election. My condolences to Barack Obama and his sister at the passing of their beloved grandmother. The final Rove & Co. electoral map of the 2008 election cycle points to a 338-200 Barack Obama electoral vote victory over John McCain tomorrow, the largest electoral margin since 1996. All remaining toss-up states have been allocated to the candidate leading in them, with Florida (27 EV) going to Obama, and Indiana (11 EV), Missouri (11 EV), North Carolina (15 EV), and North Dakota (3 EV) going to McCain. The two candidates are in a dead heat in Missouri and North Carolina, but they go to McCain because the most recent polls conducted over this past weekend show him narrowly ahead. Florida, too, could end up in McCain’s column since he’s benefited from recent movement in the state. I'm going to walk to the polling place and vote now, with my umbrella. I'll take a coin in case I haven't made up my mind by the time I get there. Virginia closes at 7. If McCain wins, and he probably will, we'll have to wait until Colorado at 9 to see who wins. Pennsylvania closes at 8. 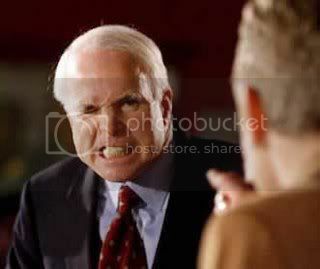 If McCain wins,and it's too close to call, Obama may as well concede. Of course, what probably will happen is that VA & PA will be too close to call and we'll be up a while. "My condolences to Barack Obama and his sister at the passing of their beloved grandmother." Do you think Obama reads this blog, Robert? I'm done voting. It took an our. There was an older gentleman in line with a Ronald Reagan ship hat (his son was on it) who was a self-appointed legal and constitutional expert; except that he had all the history wrong. He was against taxes, seat-belt laws, national holidays on voting days, Maryland (I guess the whole state) and a number of other things. There seemed to be an over-abundance of redheads in line, lots of young people, more men than women. Even though it's my neighborhood, I only recognized two faces, and those from places I've been in DC. We received sample ballots in line from the Democrats, the Republicans, and the Arlington Green Party. The line stretched halfway around the block when polls opened at 6. Dearest Anonymous, I bet the Obama campaign reads this blog just so they'll know your latest thoughts on all the issues. I bet the pollst will be open very late in Virginia. The policy holds that if you're in line at 7, you can vote, and I suspect there will be a whole bunch of people in line at 7. Probably the presidential election will be decided early in the evening, but I myself would like to stay up to see how Amendment 2 in Florida, Proposition 102 in Arizona, and esp. Proposition 8 in California do, but I doubt I'll last that long. Oh brother. Obama doesn't read this post. Your condolences were just you wanting to hear yourself talk. Usually the news show will announce the result of exit polls when the polls are supposed to close rather than wait for all lines to finish. All those gay imposition referendums are going down to defeat. “Virginia closes at 7. If McCain wins, and he probably will, we'll have to wait until Colorado at 9 to see who wins. The loud thump you hear tonight will be the sound of millions of Americans finally dropping the ill-conceived notion that religious ideology is a viable substitute for critical thinking skills. "The loud thump you hear tonight will be the sound of millions of Americans finally dropping the ill-conceived notion that religious ideology is a viable substitute for critical thinking skills." You're deluded, Cynthia. Religion has nothing to do with this election. Religious ideology and critical thinking skills are a false dichotomy. Atheism is actually irrational. Regardless, the only reason the Republican party became associated with traditional religious belief in recent years is because of the immoral pro-choice position that became a requirement for membership in the Democratic party somewhere along the line. Other than that, most other issues are open for discussion among people of good will. "just you wanting to hear yourself talk." The anonymoid accuses me of posting just to hear myself talk. Too funny. Hee hee. I believe it was Gandalf who said "the old talk to themselves because they want to address the wisest person present." This will be an historic day in Virginia. To mar that, and bring us back to reality, I see in the Post that a student in FFX ran away Friday and died in Baltimore. It is too tragic when that happens to someone that young. OK, Robert. You've conceded Obama doesn't read the blog. Why did you express condolences for a death in his family here?